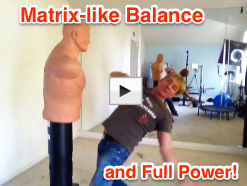 Imagine the extraordinary advantages you’d have for any athletic or combat sport if your balance training gave you super strength and flexibility at any angle. Imagine having 3D functional strength where your feet could feel like they are attached to the ground with suction cups and your body could move with Matrix-movie-like balance, flexibility, and yet still be able to execute maximum strength and power at any angle. It’s an athlete’s dream and would empower you to excel in any sport into an entirely new league. CoreForce Energy balance training quickly unlocks these abilities and more with its breakthrough strength training systems and extreme balance technique protocols that will have your competitors scratching their heads in disbelief as they’re left in the dust. Balance, super strength, speed, endurance, and flexibility are all absolutely essential attributes to develop to the highest degrees if you want to become a top athlete in any sport and to consistently have the winning edge over your competition. You cannot possibly utilize your full strength potential without superb balance. Balance training is essential to excel in all sports at the highest levels and without it, you're going to be left in the dust by your competitors. Even if you don’t have designs on being a high-level athlete, just imagine what you’d be capable of achieving if you had all of the strength attributes outlined here to utilize in your fitness exercises and life in general. Helping you achieve your physical ultimate human peak potential is what CoreForce Energy is all about. Garin Bader – Physical and Mental Marvel and Master of many advanced disciplines – from martial arts to super strength fitness to music to magic and mentalism and MORE! Many years ago I had the privilege of studying Mike Dayton’s Chi Mind Control Course with great results! The Legendary Course aided me greatly in such endeavors as qualifying for the National Drug Free Powerlifting Championships and becoming a top tactical operator and Precision Rifleman ( Sniper ) in an elite civilian Para Military Unit. BUT I always hoped for more advanced materials in Mind and Body control. Now FINALLY after all these years,another Superman arises – Garin Bader – and is offering up his secrets to take me far beyond my original training! It’s as if the fictional Doc Savage has sprung to life! Even the mighty Man of Bronze himself would be impressed and amazed with Garin Bader!